The Jewish holiday of Purim was my favorite as a kid. It was the one day of the year when I got to skip the skirt in favor of sweat pants at school (clue: put on a whistle and, oh look, you're a coach). We got dismissed early, had a carnival for most of the day, and ate ourselves silly. Most of that eating was hamentaschen, which friends give each other on Purim. 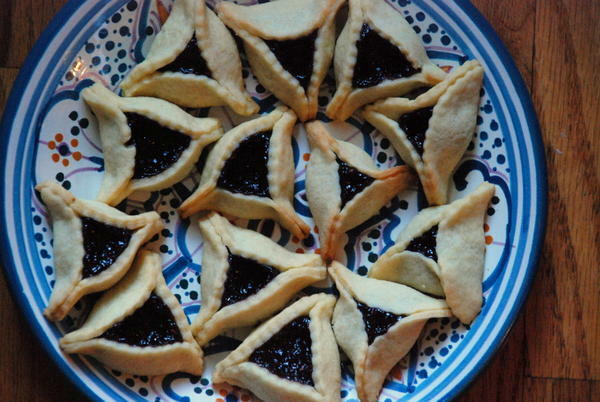 The one major design flaw: my mom's hamentaschen were way better than everyone else's. In the weeks before Purim started, I'd watch my mom make enough hamentaschen to feed a small army - but by the end of Purim, we'd have only one small box left, and lots of slightly-less-delicious hamentaschen from friends. Call me biased, but every year, I became something of a hoarder, finding and saving my favorite (poppy!) cookies before they were gone for another year. Why not make more? Because "these hamentaschen came together in a flash!" said no one, ever. But the fruits are worth the labor. And while I always make some poppy seed filling for myself and the three other people who enjoy it, this year, I've found a real crowd-pleaser: raspberry chocolate filling. The filling isn't a sauce, but it isn't jam, either. Cathy, who shared a Christine Ferber recipe that I then adapted for this purpose, calls the mixture "chocolate raspberry whatever." It's a fitting name for an indescribable but very good thing. One batch will fill about 50 hamentaschen, but if you find yourself sneaking spoonfuls of the stuff straight, don't say I didn't warn you. The easiest way to make chocolate raspberry whatever is to mix a jar of raspberry jam with the listed amount chocolate and a squeeze of lemon juice. If you're in the mood for some fussing, you won't regret making the riff on Cathy's recipe that I share below. 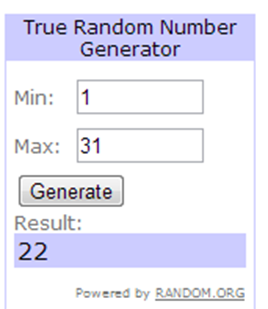 Of the 31 comments not including duplicates and mine, lucky #22 won - congratulations Laura! The lovely folks at Shabby Apple will get in touch with you shortly. 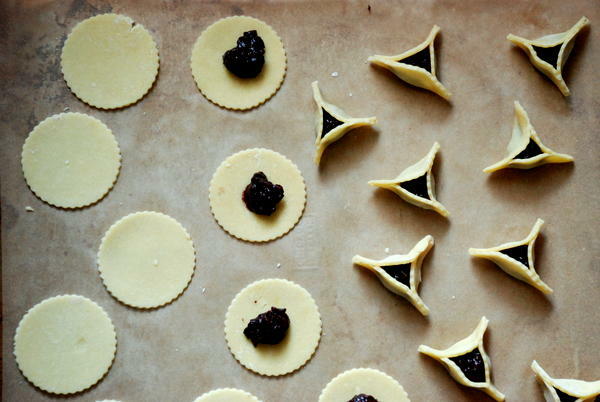 Onward: let's make some hamentaschen. First, make the sauce: Put the raspberries in a microwave-safe bowl, and heat until raspberries have thawed and exuded their liquid, about 2 minutes. don't stir the berries at all. Just let them heat up and let out their liquid. Once raspberries have thawed, strain them and either discard the liquid, or save it for another purpose. 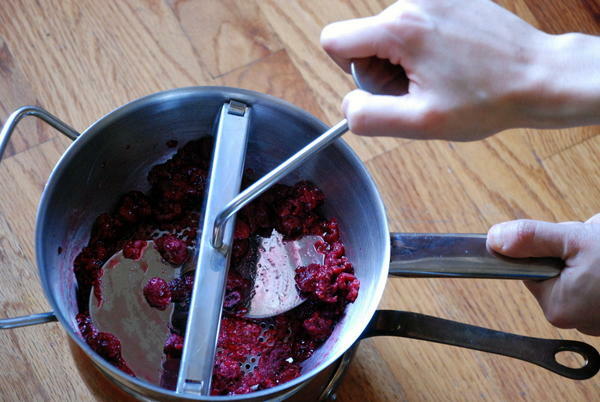 If you want an extra-smooth filling, pass the raspberries through a food mill. This is totally not necessary. Put the raspberries, sugar, and lemon juice into a medium pot, and heat on medium heat for a few minutes, until the sugar dissolves. Remove from the heat, and, if you didn't pass the raspberries through a food mill earlier, use a fork to mash them up now. Add in the chocolate, return the pot to the heat, and bring just to a simmer, stirring frequently. Simmer for about 5 minutes, stirring frequently, until sauce has thickened slightly and is uniform in texture. Remove from the heat, transfer to a bowl, and either set over an ice water bath (which will cool the sauce in 10 minutes flat) or transfer to the fridge for 1 hour. Make the dough: In the bowl of a stand mixer, cream butter and sugar for about 1 minute on medium speed. Add the egg and lemon zest, and mix 1 minute more, scraping down the bowl a couple times in between. In a separate bowl, combine baking powder, salt, and flour. Add the dry ingredients to the butter mixture, and mix on low speed just to combine. 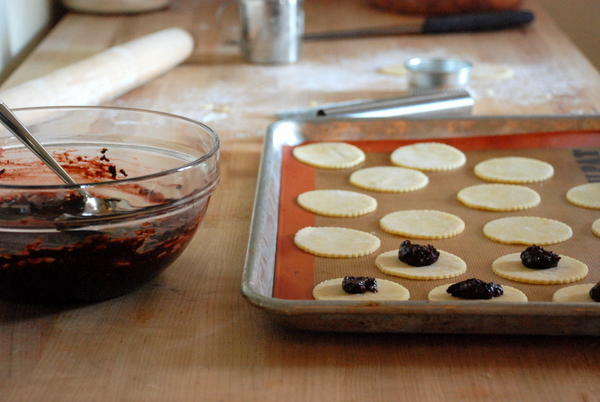 Preheat the oven to 375 degrees and line 2 large baking sheets with parchment paper or silpat. Sprinkle a work surface liberally with flour, and roll out the dough to 1/8-inch thick. 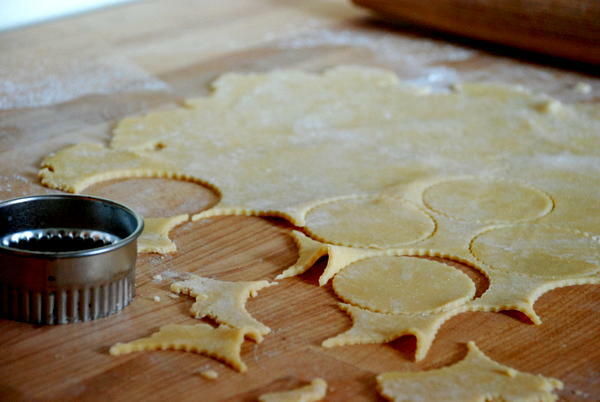 Use a 2.5-inch cutter to cut disks of dough, and immediately plop the disks onto the lined baking sheet. When the work surface is floured, the disks will pop right out when you pull up the cutter. If not, don't worry - just use a bench scraper or metal spatula to lift the disks and put them onto the baking sheet. Don't worry about spacing the disks evenly; these hamentaschen don't need much breathing room, and folded hamentaschen take up much less space than the disks. Once you've got a baking sheet full of disks, prepare your workstation: bring over your cooled filling and two small spoons, fill a small bowl with water, and get out a pastry brush. Put a scant teaspoon of filling into the center of each disk. Use the pastry brush to brush water along the edge of each disk, and then use your thumbs and pointers to fold each disk into a triangle shape (see here for pictures). Bake cookies for 15 minutes, until tops are slightly golden. Remove from the oven and let cool for 10 minutes before transferring. Meanwhile, fill your second sheet with cookies. By the time round 2 is ready to bake, round 1 will be cool enough to transfer, and that baking sheet will be free for batch 3.